Diamonds are Forever is the new ultra exclusive gem shop and you'll need to spin these reels for a chance to collect the finest of stones for your collection. Click here to play! Spin them just right and you'll leave this shop with plenty of valuable wins. Surprisingly the top symbol in this shop is the seven. 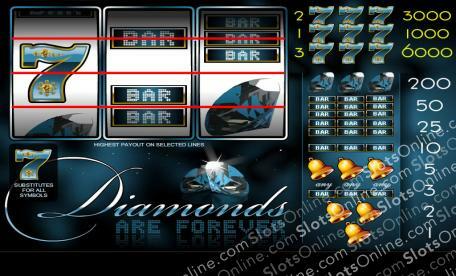 This jeweled number will bring in the top win of 6000 credits if you can spin three of them across line three. You'll get 3000 credits if you can spin three of them across line two, and 1000 if you spin them across line one. Next up are the diamonds. These sparkling gems will bring in 200 credits if three of them appear across any of the three pay lines. There are also BAR symbols. Three triple, double, single or a combination of the three across a pay line will bring in some pretty impressive wins. Finally, if you can grab three golden bells, you'll win 5 credits. Stroll through this exclusive shop to view the valuable symbols. If you can collect a few of them across the reels, you'll bring in plenty of big wins! The jeweled number seven is a wild symbol and will replace all others to help you bring in more wins.